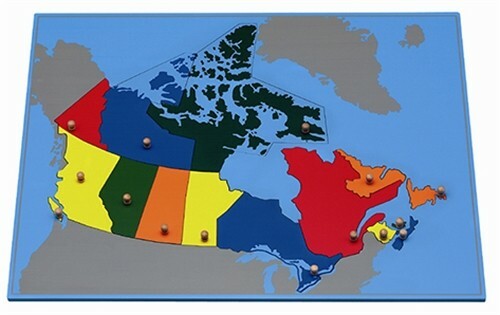 The frame of this Puzzle Map has a back. This is a modification of the original design of the Puzzle Maps. Here, the frame containing the puzzle pieces serves also as the tray for carrying the Puzzle Map, but at the same time, it imposes some limitations on all the possible Montessori activities with the maps. The teacher’s choice is typically dictated by what series of maps were adopted when the teacher received the Montessori training. A different procedure must be followed in the presentation of puzzle maps with open frames. The trained Montessori Guide is prepared to give an appropriate presentation of one puzzle map at a time, starting from simple to complex, to children as young as 2 ½ years of age. A different procedure for the presentation lesson of this map must also be followed for elementary students. The printed notes of this Montessori presentation from our CME Teacher Preparation Course are available for purchase from this webpage. Please search for Puzzle Maps Presentation.